An IT Services Company in Mumbai facing Business Growth Stagnation and having inefficiencies in Business & Functional areas including Processes, Marketing and HRD wanted to Correct and Grow. The company having realised that they are not achieving the desired growth, wanted to ScaleUp and Achieve Strategic growth with a structured correction and Growth Implementation plan. Information technology sector, specializing in IT Services. The Brief given to Re-Engineering Business Solutions (RenB) was to correct the fundamental issues which is restricting growth and to build a Comprehensive Strategy for 5 years with an Execution Plan to help ScaleUp its Business having Stagnated for the past 3 years. RenB scope included, creating a Growth Strategy and Execution Plan with Milestones and Timelines after ensuring the Business Fundamentals were corrected through a Process Intervention both in Business and Functional Areas which included areas like Business Model, Revenue Model Marketing, Sales, Product Development , Project Management , Customer Management , HRD , Finance Management etc. 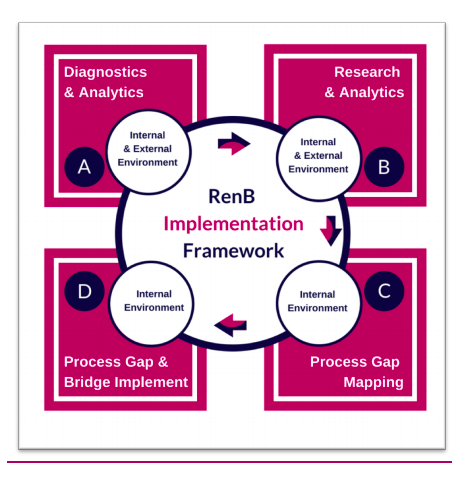 RenB started the Project a comprehensive Diagnostics Process using the RenB Diagnostic Framework to Understand the Lacunae in its current Business Practices. A Detailed Heat Map was generated which clearly defined the areas of Inefficiency and Growth Showstoppers. The Diagnostic Process threw up the areas of inefficiencies, especially with major lacunae seen in the areas of Marketing, Sales and HRD, there were inefficiencies also seen in the overall Operative areas with no Process and Systems, wherein the entire operations was manual and the Operational Visibility was LOW for Management Decision making. The Growth which was major concern was largely due to the following show stoppers. The Company did not understand the Opportunity profile and did not have any information of its customer profile and customer density geographically and demographically. There was zero customer acquisition process. There was zero customer retention process. The Company was weak in Processes and Systems with Zero Visibility. • Correct the critical Show Stoppers on an immediate basis. • Prepare the Strategic Growth Execution Plan using the RenB Strategy Framework and start implementing the same with Refinement of efficiencies parallel to ensuring the customer acquisition count increases thereby giving additional resources( Finance) for refinements which would require investments. The solution offerings went through a RenB framework of Problem Solution Dissemination and the offerings was tweaked to meet the customer pain points. Customer Profiling and density was mapped based on secondary research using RenB Research Framework and the data was used to create the Marketing Plan. Post correction of Show stoppers , The first area to be focused involved Correcting Marketing and ensuring a robust Sales Mechanism. • Marketing – Create the Digital Footprint based on a branding theme at a Low cost method using RenB Digital Framework. 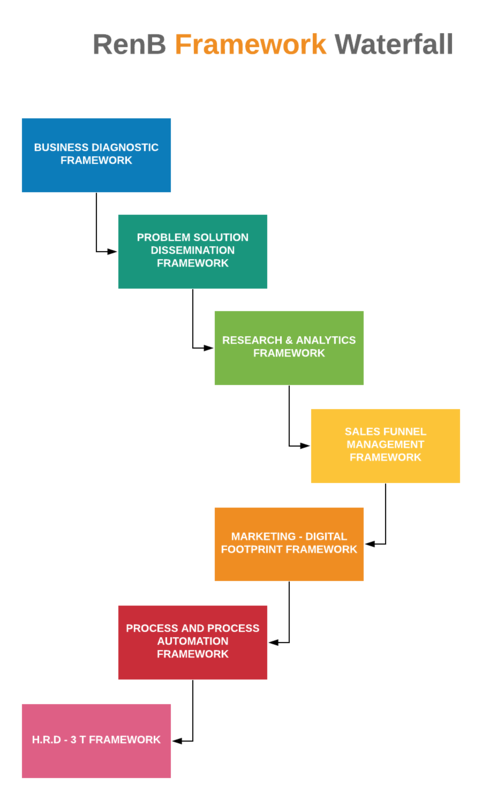 • Sales- Prepare the Identified team to ensure the sales process is implemented and customer acquisition count is increased using RenB Sales Funnel Framework. From No HRD Policy and Process to Implementing 62 Key Policy and Process for People Management and Development, adapting the RenB HRD 3T Framework, made an immediate impact with the employees and better productivity was seen in 90 days. Using Low cost SAAS tools (Recommended by RenB),some critical areas was automated like HRD and CRM, The Process Automation Through an IT Intervention using RenB Process Automation Framework was simultaneously being Deployed by RenB Associates and the Client Team to Capture and Automate all the Processes and ensure Real-time Visibility for Accurate Decision Support System ( DSS). The Strategy for Short, Medium, and Long Term with Goals was created using RenB Execution Framework and confirmed with Various Stakeholders Internally and Externally for Feedback and Confirmation. The Company achieved 52% of the Project Year Turnover In the 1st Quarter of the Subsequent Year and went on to show a 312% Growth in the 2nd year. The Client having seen the Impressive Results Continued with RenB taking on an advisory role for the next year.